Be a Viking Princess! 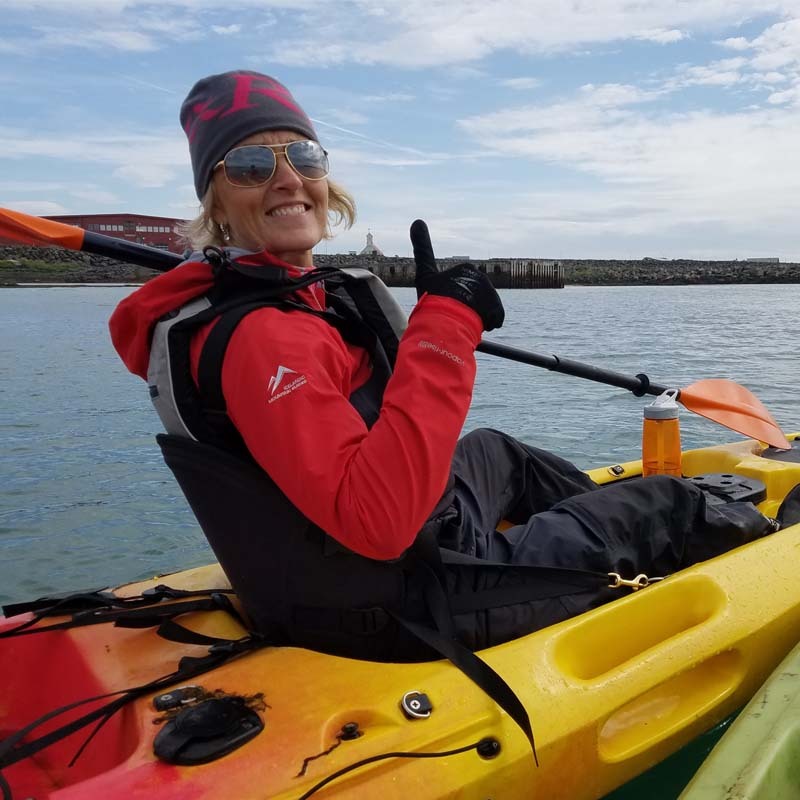 Let us help you connect with your inner warrior on this active, authentic Icelandic adventure! Laugh, eat, and move your way through paradise under the midnight sun. 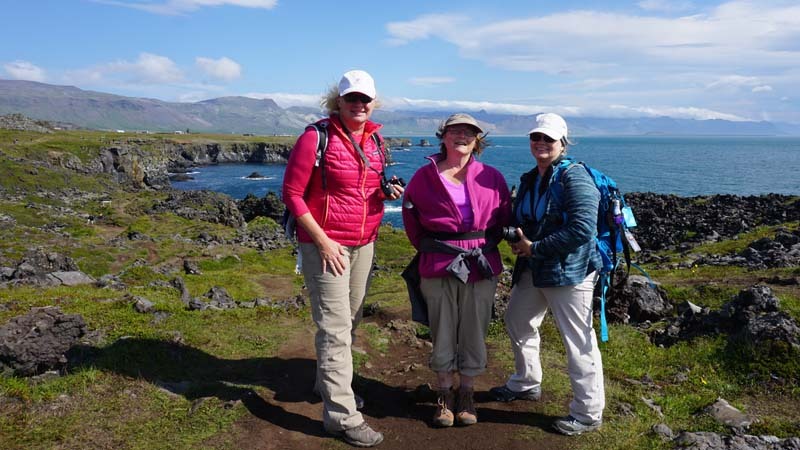 Iceland women’s hiking tour and women’s adventure is designed to challenge you, and to give you breath-taking views of cascading waterfalls, magical green meadows, rainbows (so many rainbows) blue glaciers and steaming geysers. Now is your chance to experience the Iceland not many travelers will ever venture out of Reykjavik to see. 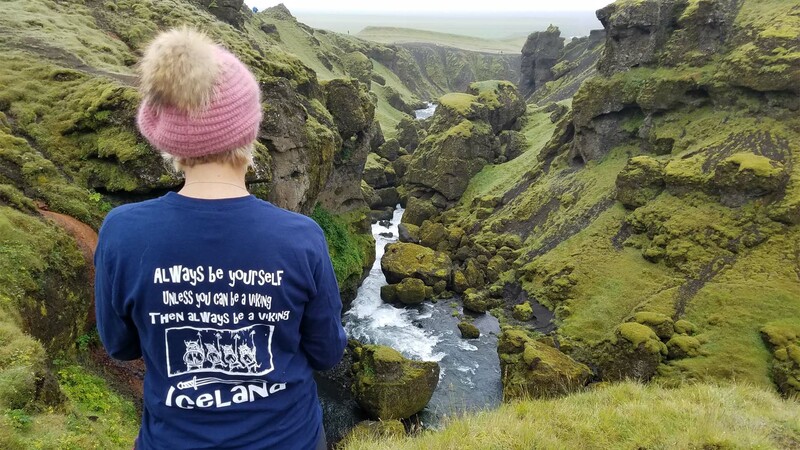 Iceland offers a massive, in-your-face, raw landscape to experience nature’s elements of earth, wind, fire, and ice and to interact with a culture over 1,000 years old! The food is delicious too! Many of the vegetables are grown in greenhouses powered by geothermal energy all year. Family farms raise farm-to-table beef and lamb in humane and environmentally friendly ways. 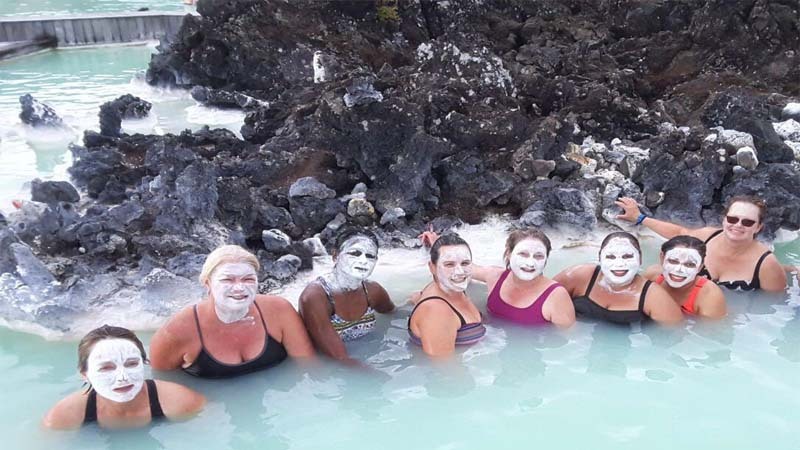 Women on our Iceland hiking and multi-sport adventure will experience a variety of scenic and rewarding day hikes tailored to the group’s interest and skill levels, sea kayaking, glacier trekking, riding Icelandic Horses on black sand beaches, and soaking in hot springs like the Blue Lagoon. 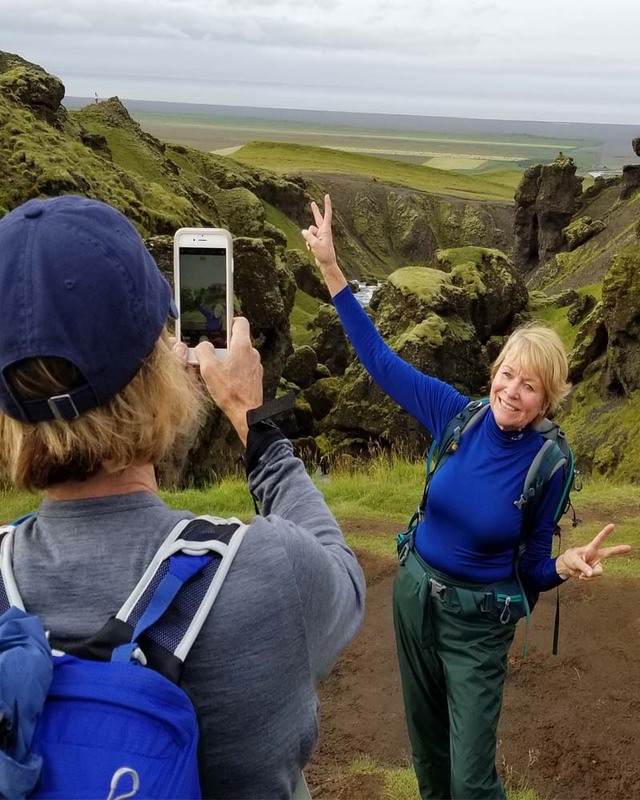 The grand finale is 15 mile hike over 3200 ft in elevation on Fimmvörðuháls pass, a trail National Geographic named one of the best hikes in the world. 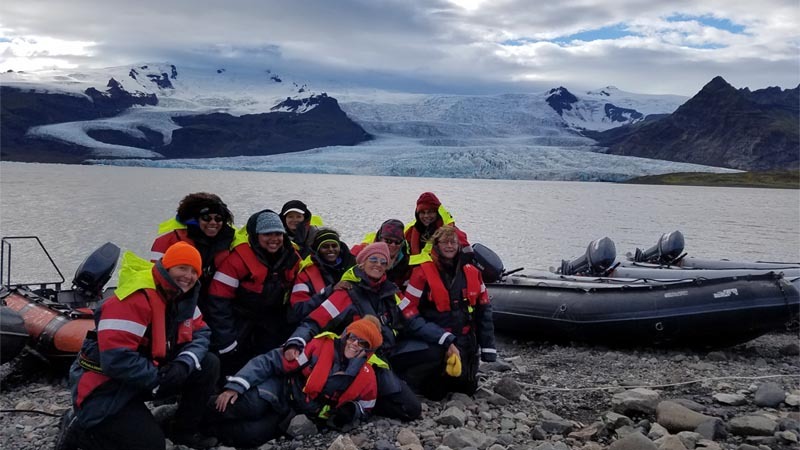 You will pass 24 waterfalls, lava fields, and between two glaciers. 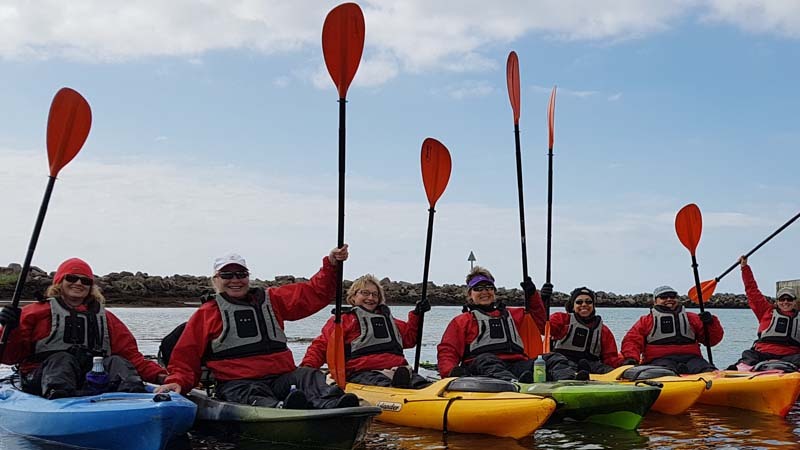 If you are looking for an active adventure with a like-minded group of travelers and future life-long friends, this is the trip for you. This trip is open to all women. Some hiking experience suggested. 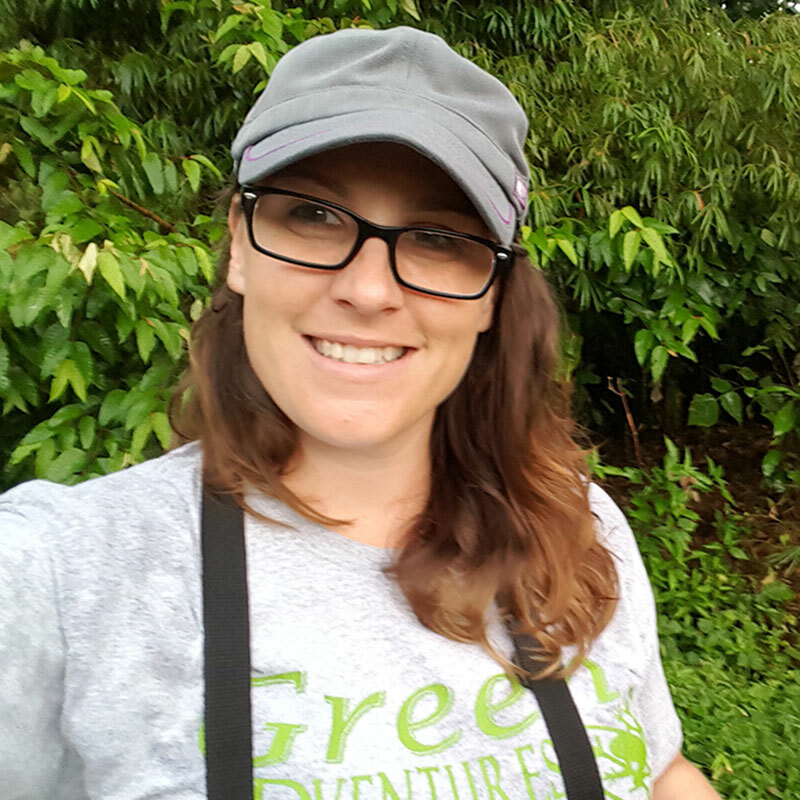 Join us as a female solo travelers, or or with a friend. There are no forced single supplements. We guarantee lots of belly laughs and future-lifelong friends. 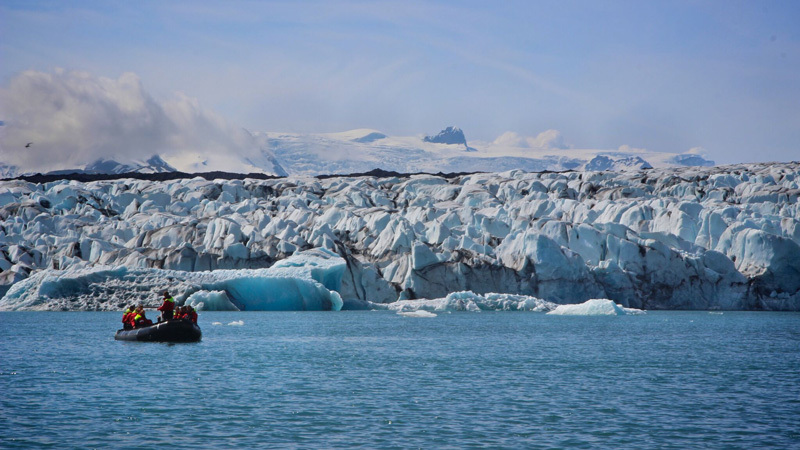 See the lesser traveled parts of Iceland including the Snaefellsness Peninsula, and spend time in small towns and hamlets. 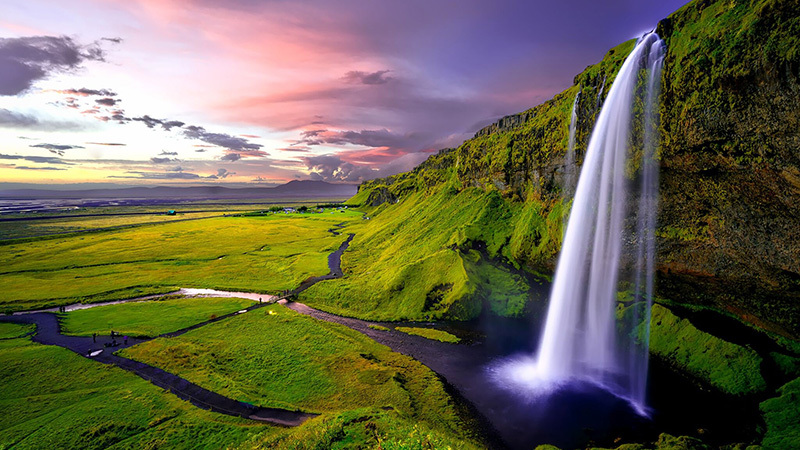 Experience Iceland’s treasures: The Golden Circle: Strukkur Geyser, Gullfoss Waterfall. Feel blue! 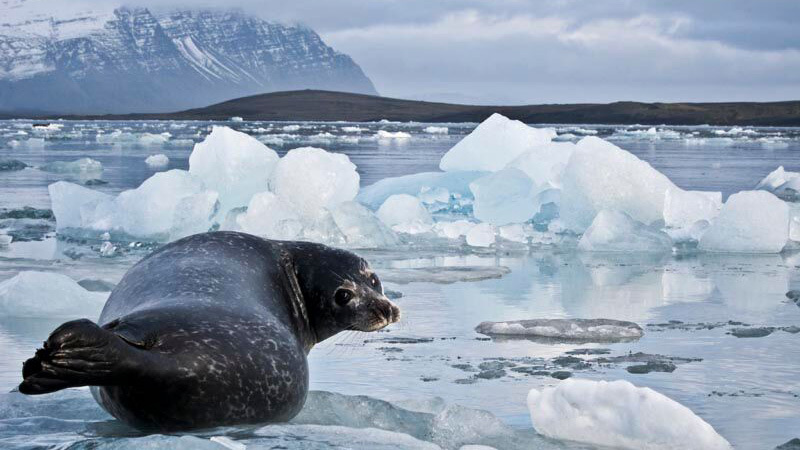 Take a thrilling zodiac trip into a glacier Lagoon to photograph towering icebergs. 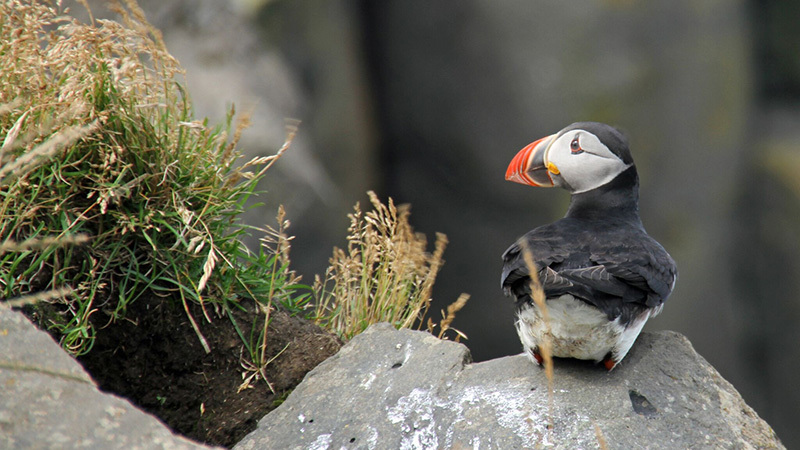 Explore the black sands and epic basalt columns of Vik, Reynisfjara, and Dreyholaey Nature Reserve. Relax in the Blue Lagoon and lesser known community lagoons and pools. 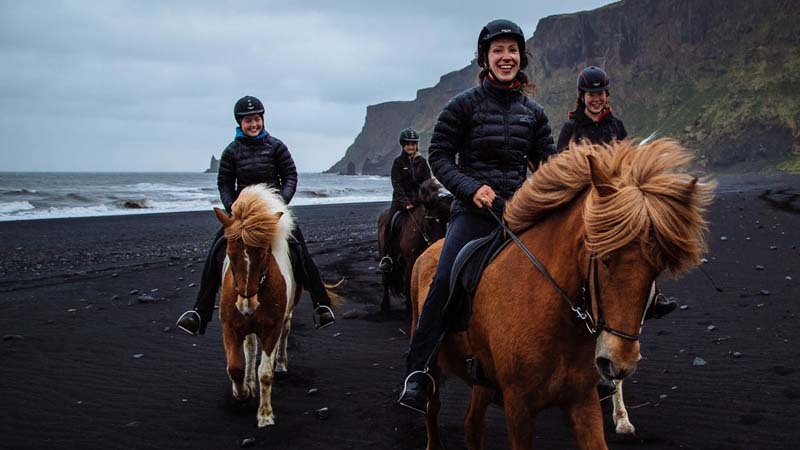 Ride Icelandic Horses on a black sand beach. Hike to a hot river through a steaming valley. Challenge yourself on a 8-10 hour hike on Fimmvörðuháls Pass considered one of the best hikes in the world by National Geographic. ►Day 1: Arrival at the Keflavik International Airport (KEF) – Explore Reykjavik. Arrival at Keflavik airport anytime. Transfer to Reykjavik on your own. Group dinner in town (not included) and overnight in guesthouse. Overnight at Reykjavik. Today we will do a fantastic 8-10-hour hike over the Fimmvörðuháls pass. Voted by National Geographic as one of the world´s best hikes, the Fimmvörðuháls Pass* from Skógar to Þórsmörk is one of Iceland´s most popular hiking routes. The trail takes us up from Skógar, along Skógá River and its many waterfalls and up between the two glaciers, Eyjafjallajökull and Mýrdalsjökull. There we will discover the recently formed lava and some of the world´s newest new craters, Magni and Móði. The fresh lava is still steaming under the surface and the heat of the lava can still be felt. 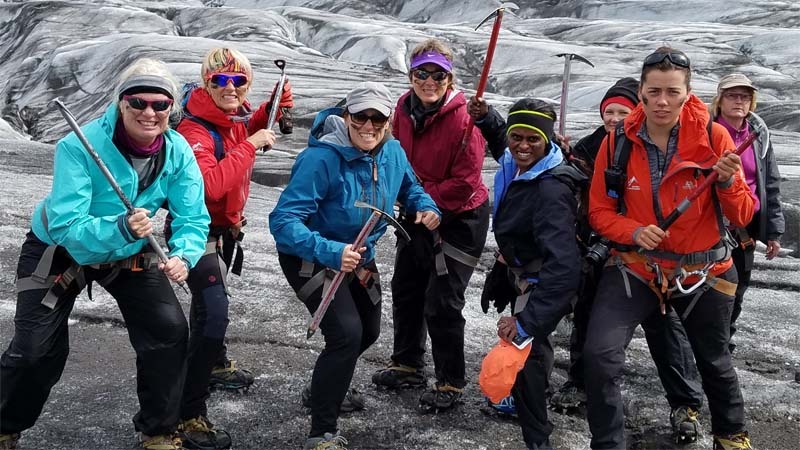 Heading down from the craters to the magnificent Þórsmörk glacier valley we continue to enjoy more geological features as well as some amazing views over the highlands and the surrounding glaciers. In Þórsmörk, we enjoy the fairy-tale landscape that surrounds the valley before we head back on a public bus to Seljalandsfoss. A short drive to Selfoss guesthouse Garun for overnight stay (B). *This is a physically challenging hike due to the duration and gradual incline. The hike is weather permitting and if we are not able to complete the hike due to weather, it will be 16 mile waterfall hike (still breath-takingly beautiful). You do not need to be sherpa or athlete to do this hike. You should be healthy and moderately active with the ability to walk for the duration carrying a backpack with 2-liters of water and some personal food & supplies for the day. You can opt out of the hike. An alternative will be provided for a self-guided day. A variety of guided hikes with unbelievable beauty. English speaking Icelandic driver and guide for 8 days from day 2 to day 9. Lodging in cute guesthouses, cabins, B&B style accommodations in double twin rooms with clean shared facilities. Deposit due by: January 1st, 2019 or until spaces are filled. Installments: Four installments of $981.25 due Feb 15, March 15, May 15, June 15th.